Today we continue in the category of notable papers and events in astronomy and astrophysics by looking at the pulsar discovery of Russell Hulse and Joseph Taylor in 1974. Several months ago I covered the amazing discovery of the first pulsar by Jocelyn Bell, Anthony Hewish, and Martin Ryle, of which the latter two were awarded the Nobel Prize in Physics. In the same vein, both Hulse and Taylor were awarded the 1993 Nobel Prize for their pulsar discovery. In this astrobite we’re going to look back at their discovery published in 1975 and show it’s impact on modern day astronomy and astrophysics. What made this pulsar special? The Hulse-Taylor pulsar (PSR 1913+16) certainly was not the first discovered pulsar, but what made it unique was that it was the first binary pulsar system! Hulse and Taylor happened upon the binary pulsar while conducting a systematic pulsar survey using the Arecibo Observatory in Puerto Rico. But what gave them the impression that this pulsar was part of a binary system? Initial measurements of the periodicity of the pulsar were perplexing as it varied between 8 – 80 μs on time scales as short as minutes, whereas any other previously cataloged pulsar varied at a fraction of this over years. The cause of this changing pulse period they determined to be due to the doppler shift caused by some kind of orbital motion. By looking at the pulse rate they were able to get a radial velocity measurement. Figure 1 shows this measurement where when the radial velocity is < 0 the pulsar is in the part of it’s orbit where it’s moving towards Earth (blueshifted) and the opposite for velocities > 0 (redshifted). Additionally through these measurements they were able to determine that the non-visible companion to the pulsar is approximately similar in mass. 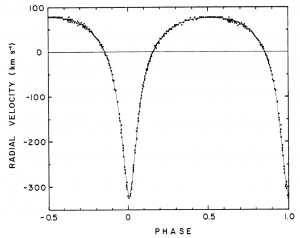 Figure 1: Radial velocity of the Hulse-Taylor pulsar which demonstrated varying periods depending on the orbital phase, and thus leading to the conclusion of a binary pulsar system. Hulse and Taylor having only limited data and observations, could only guess to the nature of the pulsar’s companion. They suggested that due to the relative masses and rotational velocity, that the companion could be either a black hole or neutron star. At a later point it is determined to be a neutron star. So we have an interesting binary system where at least one component is a pulsar, why does this become so important to astrophysics? Well because we are dealing with compact objects orbiting each other, which means two very massive objects moving at speeds comparable to the speed of light. This makes the Hulse-Taylor pulsar binary the perfect testing ground for Einstein’s General Theory of Relativity which is used to make precise predictions stemming from the deformation of spacetime in the presence of mass. 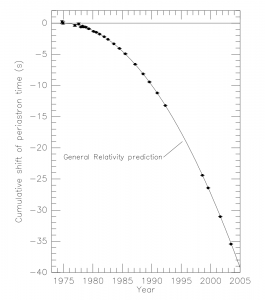 Many followup observations of the Hulse-Taylor pulsar binary system were conducted and after years of collecting more data, it was noticed that the orbital speed was increasing and the orbit getting tighter (see Fig. 2 for an example of these measurements). This is weird because it leaves a discrepancy in the system’s energy when accounting for the changes in gravitational potential and velocities. Where was this energy going? As usual, Einstein to the rescue! Using General Relativity the missing energy could be tracked down to an emission in the form of stretching and squeezing of spacetime, aka gravitational waves. The discovery of the pulsar binary and it’s missing energy in the form of gravitational waves paved the way forward for the establishment of the now well-known LIGO detectors. And as we all know from the 14 Sept. 2015 GW150914 detection, gravitational waves do exist and we can directly detect them. Even more importantly we can detect these events in different forms as was recently shown by GW170817. This type of multi-messenger detection observed in x-ray, radio, infrared, and gravitational waves will usher in a whole new era of astronomy and astrophysics.